Purpose-built in partnership with a team of cave divers, the X -Mission is designed using our most advanced technical materials and construction methods, in order to meet their demanding requirements and needs. 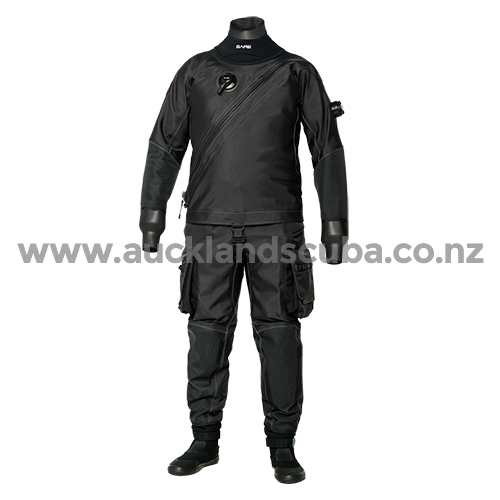 The result is the perfect drysuit for the technical diver, or for the recreational diver who wants the best.The X-Mission's lightweight and durable Nylon Ripstop material makes it great for travel and demanding cold water environments. Wear minimal clothing (ie. T-Shirt, shorts, bathing suit) at the time of measuring. All measurements must be taken with a soft tape measure pulled snug but not tight. Stand straight, looking forward with your feet flat on the floor. It is best to have help taking the measurements, in order to remain in the optimal measuring stance. HEIGHT(in) 5'2"-5'4" 5’6”-5’8” 5’8”-5’10” 5’11”-6’1” 5’6”-5’8” 5’10”-6’0” 6’0”-6’2” 5’7”-5’9” 5’11”-6’1” 6'1”-6’3” 5'8"-5'10" 6'0"-6'2" 6'2"-6'4" 5'8"-5'10" 6'1"-6'3" 6'2"-6'4" 6'3"-6'5"